Venue: Govt Services grounds, Parsons Road, Sir Chittampalam Gardiner Mawatha, Colombo. I was covering the Sri Lanka versus India Volleyball final. It was a pleasant balmy evening. The entire ground, road adjoining the volleyball court was filled to the capacity. There was cheering everywhere. The battle between India and Sri Lanka was like ‘Greek meeting a Greek’. They were unbeaten sides. Sri Lanka volleyball team was captained by Weliweriya Liyanage Siriwardana. He hails from Gampaha. Volleyball and Gampaha were synonymous. They were inseparable. It is with gratitude, I mention the name T D L Charles who made volleyball popular in the Gampaha district and also in the country during 1950-1970. He is considered as the father of volleyball in Sri Lanka. T D L Charles was the volleyball guru of W L Siriwardane and the Sri Lanka volleyball team. Then there was D C Alahendra who coached and assisted the Sri Lanka volleyball team. Arumugam, Secretary of VB Federation and Premadasa of Police were fine VB administrators. By 4.30 pm the two teams, India and Sri Lanka were introduced to sports loving Leader of the Opposition Dr N M Perera. The first set was on. It was a ding-dong battle. The game was electrifying and exciting. Indian skipper, six and a half feet tall, majestic personality Bawa was the key player in the Indian side. The Sri Lankan side was dominated by two brothers – skipper W L Siriwardana and W L Piyaratne. The Sri Lankan team covered the Indian dashes and at one time they dominated. While passing the ball, players made very interesting remarks. The massive crowd, was cheering all the way. The game was so thrilling, Dr N M Perera, stood on his chair and started cheering. Sri Lanka were leading 10-6. Indians found difficult to retrieve the lightening dashes of Siriwardana, Piyaratne and south paw Cyril Jayasinghe. The passing of the Sri Lankan players were excellent. Sira was near the net. His brother, balanced the ball so well on the air and gradually passed it to his elder brother Siriwardana. Piyaratne shouted. The crowds were singing ‘hammer, hammer’. In any sphere, immortality is no easy achievement. The writer, painter, artist, composer, sportsman or sportswoman live as long as their works and their achievements are allowed to live. Leaders, productive citizens who served their countries, war heroes, who sacrificed their lives to safeguard territorial integrity of their motherland, they too live after their death. Sri Lanka can proudly boast of colourful sports personalities. Their outstanding achievements never fade away. Their heroics are ever remembered. For example, they become legends in their own country. This series is exclusively to Daily News - a tribute to our sporting legends, Sri Lanka and abroad. History is a social process in which individuals are engaged as social beings. What seems to me essential is to recognize in great men, legends, heroes or icons, and outstanding individuals, who at once the representative and creator of social forces. Fragments of their achievements still remains embelled in my memory. To begin this series, I selected a colourful legend of our times, in volleyball - as VB is the national game of Sri Lanka. The giant Indian players were trying to cover Sira and Piyaratne brothers’ dashes. Indian captain Bawa, and three players were guarding near the net. Suddenly Sira sprang up like a panther. Hammered a lightening ‘dash’. It was like lightening. Bawa did not have a ghost of a chance. He tried to cover his face. The power-packed lightening dash hit Bawa’s face and the entire body was covered with blood. Bawa was felled like a big mara tree. Blood was gushing out, oozing from his nose and mouth. The time was exactly 5.05 pm. Bawa was rushed to hospital. Indians were shattered and Sri Lanka won the three setter - 3-0, and annexed the title. 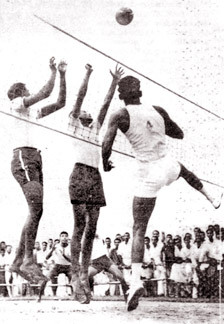 W L Siriwardene was the most colourful volleyball champion that Sri Lanka produced up to date. I presume there is no one to match him and surpass him. His ‘dashes’ are fantastic, unbelievable out of this world. W L Siriwardana was born on June 19, 1938. His father was W L Carolis Perera. Mother K A Caralina. They had three children- Ariyawathie Perera, W L Siriwardana and W L Piyaratne. Both brothers, late W L Siriwardana and W L Piyaratne, had the proud distinction of leading the Sri Lanka volleyball team. W L Siriwardana had his education at Bandarawatte Parakrama Junior School. He started his volleyball career in 1950s, as a schoolboy. He was coached by K A Rajapaksa, a teacher attached to Bandarawatta Maha Vidyalaya. Under the captaincy of W L Siriwardana, they annexed the plum of volleyball title. While playing for school, he represented a club named Nandana Volleyball Club, Ihalagama. While playing with seniors, ‘Maestro Charles’ saw him, and through their ardent supporter S H Jayatilleke Vedamahattaya of Gampaha. One day he took Sira to Charles and introduced him. Siriwardana joined the Central VB Club, Gampaha. This club was started by famous volleyball stalwarts like J P Suriyapperuma, R A Abeyratne, and ‘setter’ H C Alfred. With the formation of Gampaha Central Volleyball Club, the game became popular in Sri Lanka in 1950s. 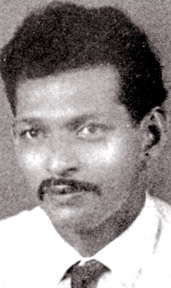 W L Siriwardana won his Sri Lanka cap in 1954, when he captained against the All-India team. He played alongside such reputed players like L A D Premaratne (John Bosco), Batcho Dematagoda, Joe Rupesinghe (Kelani Valley), W Wijesuriya (Sinhala SC, Trincomalee), Camillus Anthony (Tudella SC), D Jayasekera (Lucky Six, Potupitiya), Lennie Jayakody, R Ratnapala, Gamini Samarasinghe (Minuwangoda Central). In the 1959, South East Asian VB tournament held at Krachchi, Pakistan, W L Siriwardana won the Best Player’s award, and President Ayub Khan gold medal for the Best Dasher. The Sri Lanka VB team was skippered by T D L Charles. The other members were Lennie Jayakody (vice captain), Jackson Anthony, V H Jayasekera and W L Fernando. After retiring, W L Siriwardana became a volleyball coach, referee and a fine administrator of the game. He was a fine gentleman who possessed a golden heart. Unassuming W L Siriwardana, is one of the most outstanding volleyball players, the best dasher Sri Lanka produced. The players of this calibre saddle most of the volleyball players. Volleyball is the national sport in Sri Lanka. It is heartening to note that men’s and women’s volleyball is played in various districts today. To improve this game, you must catch the players young. It is the duty of the Ministry of Education and the Sports Ministry to take a lead role in assist and promoting this game in the island. It is heartening to note an educated, honest, committed, dedicated, dynamic young Minister Dilan Perera is taking all steps with President Mahinda Rajapaksa to popularize this national game.